This CE course will appeal to those seeking information on safe and legal performance-focused supplements. Listed alphabetically, each of the 120 supplements has a description of what it is and how it works, facts on performance benefits, current research, recommended dosages, and health concerns. The Sports Supplements continuing education course helps you separate fact from fiction, provides quick answers to the most common questions about sport supplements, and delivers information you need for evaluating supplements that may fit your athletes’ specific muscular, cardiovascular, and psychological needs. For each of the 120 supplements presented in the text The Athlete’s Guide to Sports Supplements, you’ll discover what it is, how it works, potential performance benefits, research studies and outcomes, dosage recommendations, and possible health concerns. You’ll also find recommendations for masters’ athletes, those competing in extreme environments, and those with special dietary needs such as vegetarians and athletes with food allergies and diabetes. 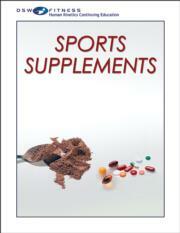 Best of all, each supplement is listed alphabetically, providing quick and easy navigation throughout the book. Alternatively, use the supplement finder to locate supplements for a particular purpose, such as recovery, endurance, and strength. And for ease of searching, many of the supplements are thoroughly cross-referenced by scientific and popular names. By mastering the content of the Sports Supplements course, you will be able to provide your athletes with a safe, effective edge to their training and performance. Kimberly Mueller, MS, RD, CSSD, is a registered dietitian and board-certified specialist in sport dietetics with immense experience working with athletes competing in the endurance and team-sport arena. She grew up competing in club-level soccer before focusing her attention on competing as a Division I collegiate cross-country and track-and-field athlete. She has also earned accolades as an All-American triathlete as well as an elite runner chasing after the Olympic Trials standard for the marathon. Mueller enjoys using her own practical sport experiences and knowledge of nutrition science to help fellow athletes achieve optimal health and peak fitness performance via creation of custom menu plans and personalized nutrition coaching with her company, Fuel Factor (www.Fuel-Factor.com). Her passion for customized nutrition also led her to help develop and launch Infinit Nutrition (www.infinitnutrition.us), a company that custom-blends functional ingredients to address the performance and health goals of recreational and professional athletes, including those competing in prestigious events such as Tour de France and Formula 500. She is well known for her nutrition clinics and as a contributor to books such as The Performance Zone, The Woman Triathlete, Triathlon Revolution, Racing Weight, The New Rules of Marathon, and Half Marathon Nutrition. As a nutrition coach for Infinite Running (www.infiniterunning.org), Mueller helps elite runners develop daily and race-day nutrition strategies that enhance endurance, facilitate optimal recovery, and protect against performance staleness. She lives in Wilmington, North Carolina. Josh Hingst, MS, RD, CSCS, head strength coach with the Philadelphia Eagles, is a specialist in the fields of nutrition and strength and conditioning, giving him unique expertise in the complementary roles of nutrition and supplementation in strength training. He has worked extensively with strength and power athletes in sports such as Olympic weightlifting, powerlifting, bodybuilding, football, basketball, and baseball. His professional licenses and certifications include registered dietitian and certified strength and conditioning specialist. Before working with the Philadelphia Eagles, Hingst was assistant strength and conditioning coach of the Jacksonville Jaguars. He also spent three years as the director of sport nutrition at the University of Nebraska. In that role he directed programs in body composition analysis, nutrition education, performance fueling strategies, eating disorder prevention and counseling, and sport supplements and hydration. Before joining the Nebraska Cornhuskers, Hingst was the nutritionist for the Atlanta Falcons during their 2008 season, after spending five years in strength and conditioning and sport nutrition capacities at Florida State. During his time at FSU, Hingst earned his master's degree in clinical nutrition with an emphasis in sport nutrition. He received bachelor's degrees in nutrition sciences and dietetics and exercise science from Nebraska in 2001.